There is no job too big or too small for our team. 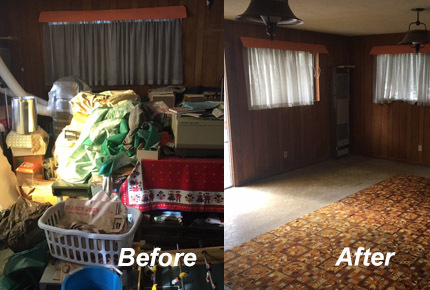 From homes filled from floor to ceiling with junk from years of hoarding to professional office cleanout service, our teams are experienced at any junk removal you need in the Long Beach California area. So what can we haul away for you? Long Beach junk removal provided by The Hauling Pros is the fast way to rid yourself of unwanted junk in Long Beach. Our mission is to make it easy for our neighbors to get anything that they no longer need packed up and hauled away. From hauling away a single appliance to clearing out an entire estate of junk, we make it simple to say goodbye to unwanted items in your home or business in the Long Beach area. What we do at Hauling Pros is make our customers lives easier when it comes to junk removal in Long Beach. We save you time and trouble when you need something removed and hauled away. It makes no difference whether it is a house, apartment, garage or office building; upstairs, downstairs or one level, we will tackle cleaning out any space. Our teams are equipped with the right tools to move and haul away almost anything you need, regardless of size, weight or material. Just let us know what you need done. Whether you just want us to remove the large, bulky items from your basement or need a complete building cleared out, we can help. Have you got a storage locker that needs to be cleaned out? Is your garage so full you can’t fit your vehicles in it? Do you have old lawn furniture that you need to get rid of? All of these are good reasons to call us. Why procrastinate any longer? One simple call and we can schedule your cleanup and junk removal. You can scratch it off your to-do list and move on to more fulfilling projects. We don’t just pick up your junk and haul it away. We make sure your space is left clean when we leave. We call this our White Glove Treatment. After we pack out the items and junk you need gone, we will sweep up the dirt and debris left behind before we haul your junk away. It is our attention to detail and excellent service that keeps our clients calling us time after time when they need junk removed from their home or business. What we do is simply what most people don’t have the time or right equipment to do. We clear out abandoned homes, cluttered garages, office spaces or construction sites, then pack the junk into our trucks and haul it away for disposal. Our team is licensed and insured for your peace of mind and our protection. Our residential clients call us when they buy new furniture or appliances and need the old ones removed. Our commercial clients know they can count on us when they need a big cleanout job done right away. What we do is make your life easier when you have any junk that you need gone, regardless of the size. Call Hauling Pros next time you need a quality, efficient haul away service in Long beach. One of the best kept secrets about Hauling Pros is our cleanup service. We aren’t a simple garbage hauling service. We will actually come in and help you bag up items that are ready to go. Hoarding cleanups, eviction cleanups and foreclosure cleanups are our specialty.